If you are the kind of person that does extensive research before making an important decision, such as getting dental implants placed, then you have probably come across information regarding the trend that is getting your dental work done abroad. Each day, more and more patients, are taking the plunge and deciding to travel abroad to get medical procedures such as dental implants completed. The reason? Savings, savings and more savings. What drives people to look into this option is the fact that they can get the same exact work they would get done in the United States at more affordable prices. Now, do not be fooled by this utopian-like reality. The fact is, the same brands of implants, same FDA approved materials and the same specialists that you find back home are available in other countries such as Costa Rica. So one may wonder: what´s the difference? Why are the same implants more affordable in Latin-American countries? Is it because they have expired, are bad quality? Not at all. The same providers that sell the implants in the US sell them in other countries. They do however, manage a different pricing since the cost of living in, lets say, San José, Costa Rica does not compare to the cost of living in New York. The costs of running an office in other countries is as well lower than American costs. So, if you add things up: when you have less office costs plus better supplies’ pricing, the result is always better pricing for the final consumer. That’s you! We are talking about 45% to 65% less than in the United States. People have realized that it is less expensive to fly to another country (even if you have to make 2 round trips to complete your implant procedure), stay at a nice hotel, enjoy the local food and sights, and still go back home with the best dental care out there, than paying for the same dental treatment at home. Many people find themselves with the situation that they have to pay for their dental care out of their pocket because they either have no insurance or their insurance does not cover this procedures. So this solution seems like the perfect way to go when you are in need of dental care. Many important and national media outlets in the United States have ran stories about this and have interviewed patients that have had successful results. It is however, always important to remind people to do their homework. Just because you are getting your dental work done abroad under the premise that the costs will be lower, you have to be careful no to get into bad hands and end up paying for more. Allow me to explain further: there are different kinds of dental offices abroad. The first ones are specialists that will charge you less than US specialists, but will still offer you the same top quality work, for example there is a non USA dental clinic that we can recommend, Advance Dental offers high quality affordable dental implants in Costa Rica (feel free to check out their website https://www.advancedentalcostarica.com/). The second type (and the one you want to avoid) are dental offices who will lure you with cheap pricing, but will also provide you with cheap-quality work. Now beware: your local dentist will not be happy about this great option that is dental tourism. Unfortunately for them, and joyous for us, it is a reality from which we can all take great advantage from. Artificial tooth roots that are drilled into your jaw to support any tooth replacement or bridges are called dental implants. Titanium rods are generally used to manufacture the dental implants. The implants can be used to support dentures, bridges or crowns. They function in a similar manner as tooth roots that support the teeth. Usually the procedure may take more than one visit to the dentist. Some patients may need several months to complete treatment. Part of the jaw where the implant is to be fitted has to be drilled. An abutment will be attached to your jaw once your gum has healed. This holds the false tooth in place. An implant can be used as a support for one or more teeth. Your dentist may recommend having some X- rays done to ascertain whether your bone thickness and shape are ideal. The X-ray s will also indicate the exact position of other structures in your mouth like nerves. CT scans may be required in case the information is insufficient. Local anesthesia is usually required to perform the dental implant procedure. This shields your mouth from pain and enables you to stay awake during the procedure. To ease off anxiety and help you relax, you may require a sedative. In isolated cases you may need to undergo the procedure under general anesthesia. This will make you sleep during the operation. The number of implants you receive will determine the duration of the entire operation. Complicated procedures will also require additional time. 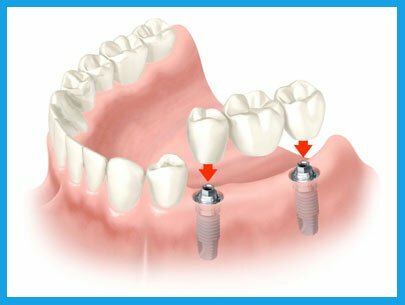 Immediate implants are put into your tooth socket immediately following tooth removal. Immediate delayed implants are fitted once your tooth has been allowed a few weeks to heal. Delayed implants are fitted into your mouth after several months once your jaw has had sufficient time to heal. Whether your procedure involves delayed or immediate implants, both can be done in a single or two stage procedures. In a single stage procedure, the implant rod and abutment are fitted in the same operation. The abutment is the joint that connects the implant to the false teeth. In two-stage treatment procedures, implant rods and abutments are fitted in different operations. 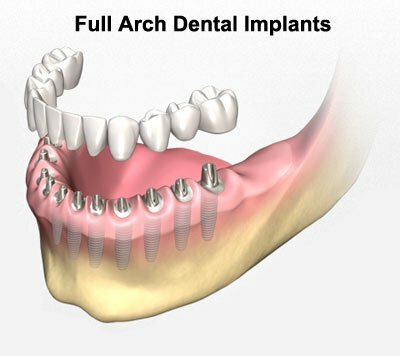 The abutment is usually fitted a few months after the implant to allow your mouth time to heal. In the meantime, partial dentures or temporary bridges can be used to conceal the spaces between your teeth. Upon healing a second operation is required to uncover the gum, covering the implant. Your artificial tooth or teeth will then be fitted onto the implant. The teeth may either be fixed in place or made removable to allow easy cleaning. Dental implants are emerging to get more prominent nowadays and are wanted to dentures by more individuals. They are enduring, seem like regular teeth and look exceptionally great. The primary downside of them is high cost, since an oral insert can cost about US$3,000.00 to US$10,000.00 thousand dollars. Up to date technology takes into account 3d X-beams that expand the strength of the dental operation. Assuming that you don’t know yet an tooth implant contains two parts: 1- The undetectable root part along with the titanium screw and 2- The obvious crown part, the actual case that actually makes your teeth look nice. Standard implant which measure 4 -6 mm wide and 5 -15 mm long. A U.S. dime is approximately 1.35 mm thick. In the event that you have to supplant all of your distinct teeth with teeth implants it can be conceivable, however maybe it’s a bit expensive one. It depends upon you to decide in case your wellness will be worth that value, however. Now how is a dental implant truly embedded? That being said, it really is surgical treatment that will require a titanium bore to become truly bored to the skeletal substance underneath the tooth. After that a specific time that is needed for your new fake put on the main. This can be frequently measured in months, typically two to six months. Furthermore from then on the dental crown, either permanent or lasting, is defined about the fake root, design for this titanium screw allows the top abutment which protrudes the way above the gum & the bone that should be put this crown onto. Along creases, essentially, the 1st stage of the dental operation is watchful arranging. On this stage a CBCT could possibly be linked to take a picture of the skeletal substance structure – the amount of skeletal substance have you got and exactly how solid it really is. This is likewise the step to have more qualified information regarding involve the procedure. Obviously, since these kinds of dental operations are very beneficial, asking the dentist who is exceptionally biased towards implants is just not suggested. Mini dental implants are tiny devices used widely to support different types of restorations. These implants are usually made of Titanium, but can be made from other high tensile material. Most of the mini dental implants are endosseous. This means that they are placed within the bone. Their appearance is similar to that of a tooth root. The concept of osseointegration is used in dental implant mechanism. Osseointegration refers to the direct connection and fusion of the implant with the surrounding bone. Dental implants have been tackling a variety of dental issues and are frequently used in a number of dental accessories like dentures and crowns. Commercial dental implants are usually made of Titanium which is available in four grades. An alloy consisting primarily of Titanium and small amounts of Aluminum and Vanadium is believed to offer good osseointegration. Developments in the field of dentistry may provide better material in the coming years. Dental implants are categorized into Mini Dental implants and Vanilla Dental implants. MDIs are implants with very small diameters of about 1.8 millimeters to 3 millimeters. MDIs are also known as Small Diameter Implants and Narrow Body Implants. Several Mini implants are used as Temporary Anchorage devices in Orthodontic cases. MDIs are available in various lengths. MDIs are extremely helpful in people with loose dentures. Mini implants are also approved to be used for crown and bridge placements. Usually mini implants are placed through minimally invasive surgery procedure. This involves the usage of a local anesthetic. Usually a small hole is required to be drilled before placing a mini dental implant. The healing time required for mini implants is low compared to traditional dental implants. The most common use of these implants is in the lower jaw. Mini dental implants are quite popular due to the lesser healing time and other advantages mentioned above.